In Savannah, just like every other vacation destination, a rainy day can strike at any time. With so many interesting and unique points of interest around the city, it’ll take more than a few raindrops to ruin the day. 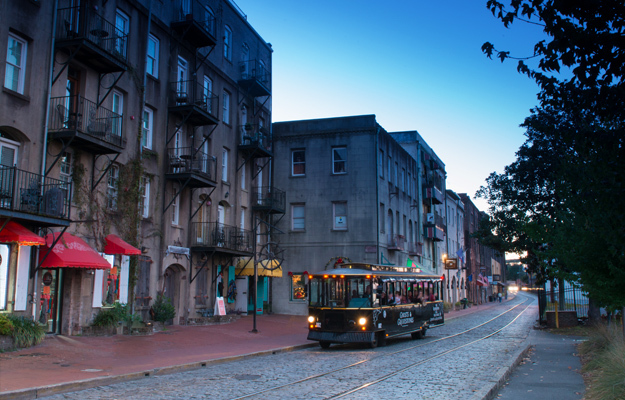 Here are a few ways to make the most of your trip to Savannah no matter the weather. 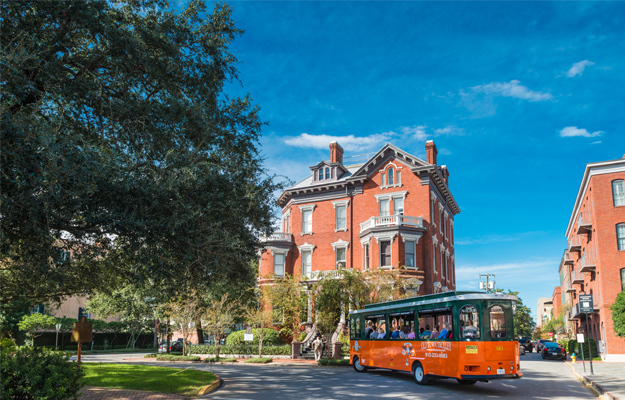 Stay dry while enjoying an all-day tour that allows you to hop on and off at 16 stops near Savannah’s most popular landmarks and sites. 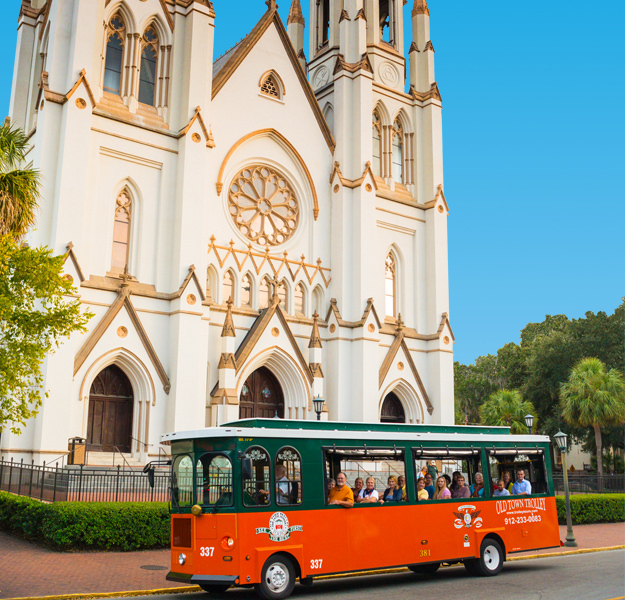 Learn everything there is to know about Savannah from fun, knowledgeable tour conductors aboard an Old Town Trolley Tour. See the city as it passes by from a great vantage point afforded by the trolley’s big viewing windows. Hop off when you see something you want to explore along the route. Trolleys come by every 20 minutes or stay on the continuous loop and get ideas of where you want to go when the rains stops! The City Market is a promenade of shopping, art and food spanning four city blocks. Watch sweetgrass baskets being woven the old way and don’t leave Savannah without one! Watch as renowned artists work in their studios in the Art Center and browse galleries displaying the work of over 50 local artists in co-ops and individual galleries. Try seafood and steaks at Belford’s fine dining or the European bistro style at the Café at City Market. The frosty daiquiris (alcoholic, non-alcoholic and sugar free) and a great meal at Wet Willie’s is a must, and don’t forget to try the pizza at Vinnie Van Go Go’s. This lovely, elaborately ornamented Southern Gothic mid-19th century rural garden cemetery, straight out of the highly romanticized Victorian era, is a place of lovely grounds and beautiful statuary. On a nice day, its park-like setting is great to walk, but if it’s raining you can still see it by driving through the property! Located just east of the historic district, on a bluff high above the Wilmington River, it has lovely natural landscape, beautifully ornate sculptures and plenty of folklore associated with notables and ordinary people interred there. Bonaventure is just what it was meant to be, a beautiful park which encourages people to appreciate the serenity of the landscape and the beauty of the art. Let it pour as you watch the Savannah riverfront skyline drift by through big viewing windows in the indoor, air-conditioned comfort of one of the many Savannah Riverboat Cruises. Choose the way you want to go, brunch, lunch or dinner cruise, which take place on different days aboard either a stern-wheel paddleboat or riverboat. Here’s your chance to kick back, relax, take in scenic views, listen to live music and enjoy a sumptuous buffet loaded with many low country favorites. The Luncheon Cruise happens on Saturdays only; the Sunday Brunch is naturally on Sundays only. Or, nightly April through October the Dinner Cruise overflows with delicious buffet treats and great live entertainment. Get into a rousing, hand clapping, body swaying mood aboard the Monday evening Southern Gospel Dinner Cruise complete with great southern food. How about this option for a rainy day evening: get involved in a fun “whodunit” on the Thursday Night Murder Mystery Cruise. While there is no meal served during this cruise, snacks and cocktails are available for purchase as the mystery unfolds. Inside the elegant Greek Revival Scarbrough House, originally built in 1819 and last restored in 1997, the great era of maritime shipping, trade and travel in the 18th and 19th centuries is on display. Exhibits of fantastically detailed ship models, stretching though American maritime industry from Revolutionary War era to the Civil War and WWII are astounding. From sailing vessels to tankers, exhibits are separated into time periods throughout three floors of models in this architecturally significant historic building. The Ships of the Sea Maritime Museum is all about the ships that have plied the waters, initially to and from England then to points beyond. Nautical paintings and maritime antiques and artifacts round out the collection. While the museum is small, it is totally engaging, especially for architectural and maritime history buffs. The garden, the largest within the historic district, is lovely and the gift shop is filled with books related to maritime life, arts and history. Visit our detailed blog article about the Ships of the Sea Museum and use the coupon code for exclusive savings. Many pass by this delicately massive and magnificent church, admire its exterior, and often walk by not really knowing if they can go in. Unless there is a mass in progress, step inside and allow its beauty to take your breath away. The French Gothic church, home to the oldest Roman Catholic congregation in Georgia, is astoundingly beautiful – a calming, serenely majestic place to spend part of a rainy day. Not only is it beautiful, it has a fascinating history. A congregation first organized by French Catholic emigres from Haiti in the 1790s, there were several church buildings before this one, which was built first built in 1873 then rebuilt after a devastating fire in 1890. Even though it is architecturally massive, it feels warm, welcoming and embracing. The Gothic architectural details are astounding, from the lofty heights of vaulted and domed ceilings rising way overhead to the lovely Great Rose window directly above the organ are emblematic of Gothic Churches. The Carrara marble baptismal font, a pulpit carved with the 4 evangelists (the Apostles John, Luke, Mark and Matthew), gorgeous murals symbolically conveying important spiritual messages, exquisite stained glass windows casting a glow of colored light as they tell the stories of the lives of Jesus and the Virgin Mary round out the must-see details of this structure. This is a great stop after a visit to the nearby Cathedral. Pop open your umbrella and walk over to Gryphon on Madison Square. It’s a favorite for its tasty, fresh seasonal offerings, friendly service delivered by SCAD students, and delightful ambiance inside an old apothecary shop in the ornate 1926 Scottish Rite Building. Spend a rainy evening at either one of these two architecturally beautiful historic theaters offering a great selection of performances. Always on the radar of locals, but not so well-known among visitors, both are must do Savannah experiences. Located on Chippewa Square, the Historic Savannah Theatre, built in 1818, is the oldest theater in America still operating on its original site. It offers a wide range of great live productions, ranging from rousing Gospel music to high energy variety shows of song, dance and comedy from every genre. Lucas Theater for the Arts on Abercorn Street started as an extravagant movie theater in 1921. Built by film entrepreneur and Savannah native Melville Lucas, Jr., it was way ahead of its time in design and film screenings. After a great run, its doors closed in 1976, but fortunately the building was saved from demolition by massive community fundraising. After a lengthy passage of time, and now owned by SCAD, it reopened in December 2000 as a wonderful, intimate theater for theatrical productions, opera, orchestra, country stars, films, musical performances, film festivals and song festivals. Gorgeous architecture, good seats, great acoustics, wonderful performances, wine and beer service – it has it all! Grab an umbrella and brave the elements! 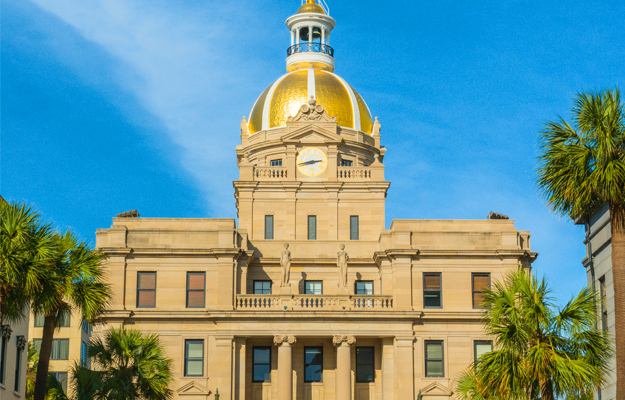 In a city seeped in history, this area offers a glimpse of what’s exciting, new and trendy in Savannah. Located off-the-beaten tourist path, locally-owned shops and boutiques are a delight. Some of the most notable delights include Unique hand-crafted gifts, upcycled furniture, antiques, estate silver, French pottery and relics, antique maps, prints and unique books, monogrammed luxuries, upscale souvenirs, exotic gifts and jewelry from other lands, specialty papers, art galleries and art and design works of SCAD students and faculty. Be sure to have lunch at Mrs. Wilkes on Jones Street for a dose of Southern hospitality and family style cooking. A rainy night definitely adds to the spooky factor of this ghost tour as you experience a very different side of Savannah, which is named American’s Most Haunted City. Throughout the Ghosts & Gravestone Tour, winding along shadowy streets, stories of hauntings and dark pasts are revealed by talented and engaging Ghosts Hosts. The fun begins as soon as you board the Trolley of the Doomed and head out along dark rain-slick streets and around dimly lit squares, whose moss-draped trees take on the look of mysterious apparitions. As the tales unfold, familiar places by day play tricks on the mind as they’re cast in night shadows. Two stops along the way, one at the Andrew Low House and the other at Perkins & Son’s Ship Chandlery on River Street, provide a chance to commune with spirits of the past. See if your camera can capture an orb, or feel the chill of a nearby presence. Recently added to Savannah’s list of attractions, is the country’s only Prohibition museum. A perfect stop for a rainy day, the Savannah museum is fully indoors with various interactive exhibits. Inside, you’ll find live actors dressed to the nines as well as many vintage cars, realistic wax figures some of the era’s most infamous personalities and at the end, a fully-stocked and functional Speakeasy. Once your tour is done, you’ll walk through to the bar and there, you’ll find friendly bar tenders ready to take your order! The museum takes between 45 minutes to an hour to tour and time spent at the bar is up to you!